The 20-year old resident of 589 Amsterdam Avenue died at the entrance of the pizzeria on the corner of Broadway and 100th Street, desperately seeking help as his life ebbed away. McClain was allegedly stabbed in the chin and chest a block away by Jashawn Gorham, 18, of 74 W. 92nd Street and Brighton Montgomery, 17, of 120 W. 91st Street. Patrol officers witnessed the attack, which started on 99th and Broadway. The two suspects were apprehended at 96th and Amsterdam and charged with murder, assault and criminal possession of a weapon. Both suspects were members of a known gang and were identified by thorough police work by members of the 24th Precinct. The neighborhood remains shaken by a midweek murder in broad daylight on the area’s main thoroughfare. The West Side Rag reported: “Officers discovered the victim, McClain, lying unconscious and unresponsive in front of Cheesy Pizza at 2640 Broadway…Police recovered a knife near the scene. In response to the assault, 24th Precinct Commander Capt. Seth Lynch announced increased patrols to combat gang violence. The City was working for many months to acquire a big chunk of the portfolio of buildings owned by the Podolsky family that serve as homeless shelters. This acquisition was a cornerstone of the Mayor de Blasio initiative, “Turning the Tide On Homelessness,” a plan released 23 months ago. After spending $1.7 billion in taxpayer money annually to solve the homeless problem, the Department of Social Services, headed by Steven Banks, came up with the idea to stop paying rent to landlords of decrepit properties and buy them out. But the Banks plan ignored one of the first scandals de Blasio faced as mayor, when he accepted money from the Podolsky family, and even attended a fundraiser held in the Long Island City penthouse of their employee, former City Homeless Commissioner Robert Hess, the Daily News reported. Construction is under way for a new apartment building on Broadway at 91st street. Bank of America’s kiosk-size branch will have to move; a six-story vacant apartment building and two-story retail/office building will also be demolished. The new 15-story high-rise, developed by Tomas and Robert Rosenthal, will have setbacks starting at the 12th floor. Plans also call for a third-floor terrace and balconies from floors four to twelve. Le Pain Quotidien, housed in the neighboring two-story Broadway building to the north, closed a week ago due to the pending demolition. 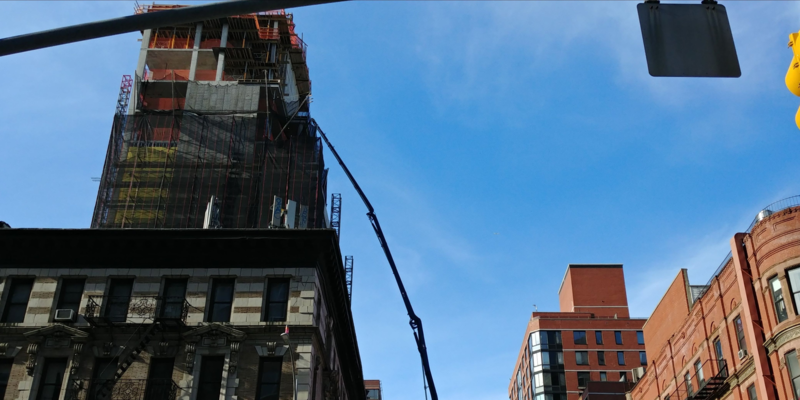 A basement laundry service at 251 W. 91st street was shuttered in late 2017 in anticipation of the construction. According to the West Side Patch, the new property will have 33 residences and two retailers. Plans were filed with the Buildings Department in June 2017. 2503 and 2505 Broadway, which at various times housed retailers such as Europan, Radio Shack, Payless Shoes and Lechter’s housewares, has been undergoing rat and asbestos abatement, usually the last hurdles before demolition. Residential developer Adam America acquired the one-story retail properties with $50 million from MSD Partners, an investment firm that invests computer magnate Michael Dell’s money. Demolition is expected shortly on the building housing the former Gristedes market on West 96th Street and Broadway. Other former tenants included Chase Bank, Rite Aid and a tanning salon. Extell Development bought the property for about $80 million and secured an additional 50,000 square feet of air rights to build higher from a nearby co-op building. Extell plans to erect a roughly 200,000-square-foot residential building (or at least 20 stories) on the parcel. The adjacent one-story McDonald’s is expected to remain on Broadway. A Building Next to Extell’s? There have also been rumors about another smaller development on the West 96th Street block closer to West End Avenue, which may use the footprint of the Salvation Army store and the NAACP building. No plans or formal announcements have been issued. An 18-story condo called The Dahlia opened a sales office on Broadway between 91st and 92nd Street in the Equinox building. The 95th street building will house 38 residences, including two, three and four-bedroom units. The completed building is expected to open later this year, making it the first of the development wave in the West 90s to hit the market. The site of the Shaare Zedek Congregation, whose synagogue was demolished in 2018, will soon be a 14-story property. The first three floors will be the new home of Shaare Zedek; the upper 11 floors will be residential. Foundation work began recently. With so much new construction, let’s not forget that 720 WEA is restoring this Emery Roth masterpiece to 21st century glory, featuring a completely rebuilt interior with full luxuries. The exterior restoration of what was once the Marcy Hotel was recently approved by the Landmarks Preservation Commission. The work includes an eight-story extension on 95th Street that replaces a rear parking lot. Work is expected to commence this summer. Neighborhood In The Nineties works with City and other government agencies to improve the delivery of vital services, our quality of life and public safety. These agencies include NYPD, Sanitation, Parks, Community Board, MTA, Department of Transportation, Department of Social Services, Department of Veterans, and USPS. We invite our neighbors to join us on Thursday, January 31st at 6:30 PM at Congregation B’nai Jeshrun, 270 West 89th St. This is the quarterly meeting of the NCO (Neighborhood Coordinating Officer Program (neighborhood policing). It’s a great opportunity to raise issues with patrol officers assigned to this area. At our request, the NY office of our Congressman, Jerry Nadler, filed a complaint with the local US Postal Service for not delivering mail to part of the neighborhood on two consecutive days in early January. USPS noted that they are having personnel issues and will be working hard to ensure mail delivery is daily. (emotionally disturbed person) who was throwing punches at passersby on Tuesday, January 15th at 6:30 PM on West End between 93rd and 94th streets. NYPD did not respond to our 911 call. A letter was sent by N90s President Aaron Biller to 24th Precinct Commander Capt. Seth Lynch explaining the situation. The EDP’s name is David and his history of attacking pedestrians throughout the neighborhood is well known but until now, not documented with the police. He lives at St. Louis-Rustin House, 319 West 94th Street. We have asked the officers in the NYPD neighborhood policing program to approach the St. Louis and discuss getting services for David. o Road markings at the Henry Hudson Parkway off-ramp at Riverside Drive. DOT has agreed to paint stripes in a clear zone for pedestrians that keeps back drivers coming off the highway, making it safer to cross north-south. o Long-promised speed humps on the 300 blocks of West 92nd Street and West 93rd Street (Montessori Schools) should be installed this Spring. o DOT promised to investigate lowering the Riverside Drive speed limit from 20 MPH to 15 MPH, and improving the current speed hump in the 91st to 95th Street area around Joan of Arc Island. DOT will also review the current, ineffective yield-to-pedestrian signs – we have requested STOP signs. o DOT rejected our pleas for a left turn signal and traffic bolsters on southbound Riverside Drive at West 95th Street. o DOT also turned down speed humps and stop and/or yield signs for the Riverside Drive service road between 97th and 99th Streets. The community can make this request again in 2021.